Oops - we don't appear to have a video for the Strobe XP300. On the whole I am happy with my scanner - it was bought as a replacement for a very old version which no longer had software support, so when I upgraded my computer I could no longer run my scanner. However, there are a few niggly things. With the new scanner I have to be very careful feeding the document in and I need to steady it for a good inch or two for the scanner to keep taking it, otherwise it does not feed through. Also, the slightest obstruction causes the paper to stop feeding or go off line giving a 'stretched' scan, the old scanner just seemed a bit more robust and definite when it took the document from you. On the plus side, I very much like the fact that it converts straight to PDF so that I don't have to keep converting .Max files. It is also much quieter than my old one, which many of my colleagues in the open plan office are grateful for. The fact that it can be USB powered is also extremely handy for meeting and conferences. On a rating of 1 to 5 I would give it a 4 - compact and easy to use. I have not used it a great deal. It does work (I tried it on my lap top), but I mainly use a a 64 bit desktop running XP. The problem is there is no driver for this computer / operating system combination - so I can't use it. Eventually when I change computer, it will probably get used. But this is some time off. Apart from that, it seemed quite simple when I tested it out on my laptop. 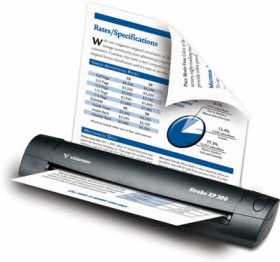 The Visioneer Strobe XP 300 is a reliable duplex scanner for the office, on the road or at home. Measuring only 2" x 2.5" x 12" and weighing a mere 20 ounces, the Strobe XP 300 is slim and lightweight. It fits neatly on a desk and packs easily alongside your laptop or in a briefcase for travel. Scans anywhere because it is powered through the USB port, or choose wall-powered mode to conserve your laptop battery. Now you can quickly scan, file and store all of your documents, plastic ID cards, photos, articles, brochures and business cards no matter where you are. The Visioneer Strobe XP 300 instantly turns paper documents into distributable digital files and when powered through the USB port, can be used even when electrical power is not available, convenient and compatible. Imagine being able to scan receipts in your car, business cards on an airplane and work effortlessly in foreign countries. The Visioneer Strobe XP 300 is a multi-tasking machine that fits easily between your monitor and keyboard. With its patented AutoLaunch Technology all you need to do is insert a document to automatically start scanning. In duplex mode it scans documents at 6 seconds per image. The powerful paper management software bundle valued at over $200.00, lets you organize your scanned documents into text-searchable PDF files and store them in the same folders as your PC-created files from Microsoft Office, Adobe Acrobat and numerous other applications. Transform volumes of paper, photos and existing electronic files into organized digital files that you can quickly find, use, share and store. In PDF format, you can instantly search documents for keywords or phrases. This gives them additional archival benefits beyond traditional storage, and the widely accepted PDF format lets everyone view and print documents - on any computer. The result is the ideal solution for streamlining information and making it easy to find. In healthcare, about 20% of the claims submitted by hospitals are denied by the insurance companies. Ninety percent of those are due to typographical errors. By scanning patient documents, insurance cards and drivers license at patient registration and creating a digital image accessible to the patients authorized care providers; hospitals can reduce registration time, solve data inaccuracy problems and improve customer relationships. Insurance/Banking/Legal: From Sarbanes-Oxley to the PATRIOT act, records management has become an important part of doing business. However, most legislation and regulations have been handed down with no road map for compliance. A document scanner is therefore essential to first digitize paper records into electronic files that can be securely and accurately stored, transmitted and retrieved. Road warriors looking to maximize productivity even while holed up in a hotel room will easily appreciate the versatility of the Strobe XP 300 as a mobile scanning solution. They can quickly capture the day's contracts, business cards, briefing papers, and expense receipts, unplug the scanner and slip it into their laptop bag. When used in the office, it is a sleek, unobtrusive tool for managing the paper that lands on your desk throughout the day.